LAHORE: The Provincial Disaster Management Authority (PDMA) Punjab in collaboration with Rescue 1122, District Administrations and other provincial departments, marked National Resilience Day on Monday to remember the victims of the catastrophic earthquake that hit Pakistan on October 8, 2005. This year’s commemoration was under the theme Tayyar Pakistan that aimed at creating awareness by spreading the message of resilience building, preparedness while highlighting anticipated hazards, threats and possible measures for reducing the impact of such risks. In this regard, awareness walks, seminars and photo exhibition were held and a one-minute silence was observed at 8:50am across the province to remember the victims of the incident. Separate prayers were also held for the victims. PDMA Director General Rashid Ahmed Khan flanked by PDMA Director Dr Khurram Shahzad and other senior officials of various provincial departments participated in the walk that took place from Nasir Bagh to Town Hall. 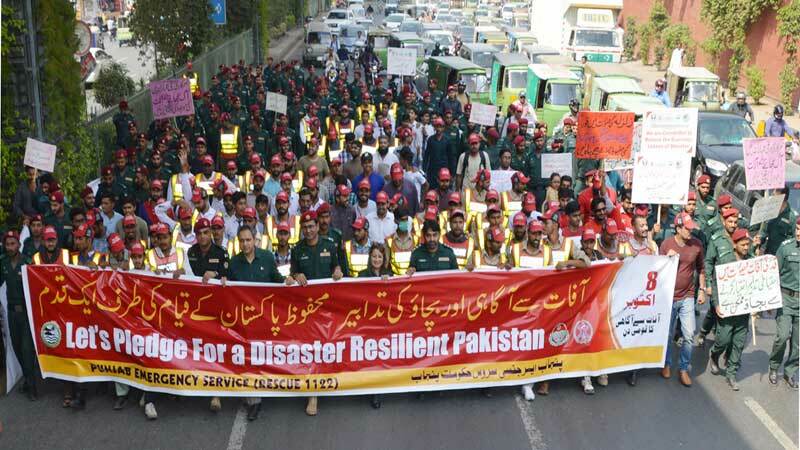 A large number of people from civil society also participated in the walk holding placards and banners with public service messages on natural and man-made disasters for the awareness of the general public. PDMA DG Rashid Ahmed Khan said that PDMA Punjab endeavoured to establish socially responsible, healthy, safer and more resilient community on special directions of Punjab Chief Minister Sardar Usman Buzdar. He also expressed grief over the sad demises of those who lost their lives in the catastrophic earthquake of 2005, adding that such incidents also provided us the opportunity of capacity building; therefore, we should focus on developing our systems to prevent future disasters. He revealed that in order to minimise disasters, PDMA Punjab has initiated an Early Warning & Response System through satellite based connectivity by integrating the Pakistan Meteorologicla Department, Irrigation and Rescue 1122 along with 20 vulnerable districts. “The PDMA had initiated the Disaster Risk Reduction Programme to ensure safety measures,” he added. He further said Community Emergency Response Training programme had been initiated to train community at large for the establishment of safer communities in all districts of Punjab. Rashid Ahmed Khan mentioned that in order to cater any untoward situation, PDMA had established state-of-the-art Provincial Control Rooms to monitor natural and man-made disasters. Moreover, it had also set up a mobile communication office to monitor rescue and relief efforts in far flung areas. Talking on the occasion, Khurram Shahzad said that the principal objective to observe this day was to express solidarity with the bereaved families who had lost their near and dear ones and to arouse the spirit of individual and group enrichment to face the challenges in the post-disaster scenario. Published in Daily Times, October 9th 2018.